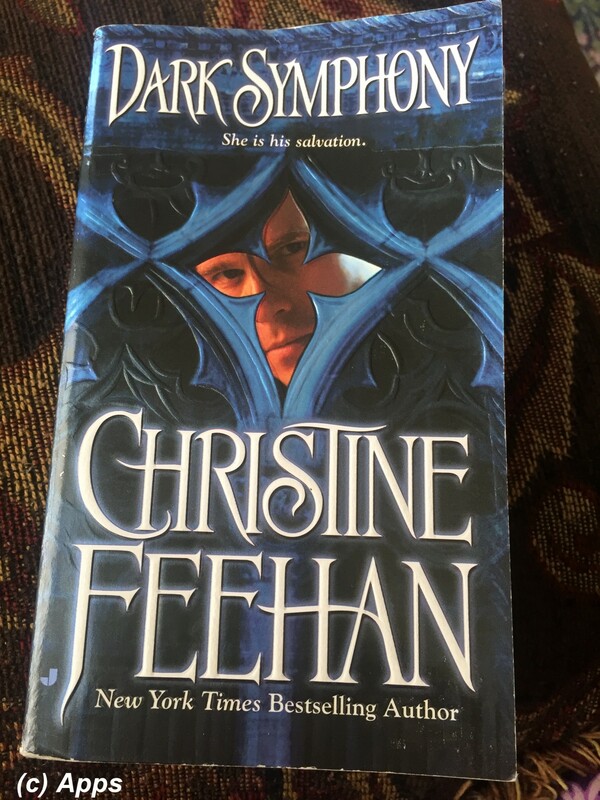 Dark Symphony is the tenth book in the longest series, Dark Series, by Christine Feehan which was published in February of 2003. This time around the plot revolves around Byron Justicano - an ancient Carpathian who was born a master of gems but honed into a warrior - and Antonietta Scarletti - a blind concert pianist with psychic powers and much more. The events in this book seem to happen a few years after the ninth book Dark Guardian, however, it isn't very clear. However, the story plot is kind of a sequel to the March 2001 stand-alone novel The Scarletti Curse; albeit the events occur centuries apart. I have to re-read that book to identify a few connections that Christine keeps referring to. This book however won a few nominations and was on bestseller lists, but not many awards. Carpathians are a powerful and ancient race who are near-immortals living for thousands of years with powers and gifts that no man can fathom. Despite their gifts and extended lifespans, they are at the age of extinction as fewer and fewer children are being borne and far lesser of females. Without their female counterpart aka "lifemates" the male Carpathians lose the ability to feel emotions leaving the males with hard choice: either become vampire or "greet the dawn" (i.e. commit suicide). Now that Prince Mikhail Dubrinsky finds a lifemate in a human female who has immense psychic abilities and is capable of converting, there is hope for all the other Carpathian males who have been holding off from turning into vampires – the very creature that they hunt and kill to save the humans and Carpathians alike. With this book, Christine expands her creatures and introduces the Jaguar species. During the plot of the second book in the series Dark Desire, we see that Byron Justicano - Jacques Dubrinsky's best friend and would become his right hand if ever Mikhail succumbs - had been tortured and hurt by Rand - an ancient Carpathian and Shea's biological father. After that he practically disappeared and we hadn't seen him even briefly any of the books that follow. I was beginning to wonder what happened to him and finally Christine provides a story for him. Byron, a master gemologist and friend to Jacques, goes on a self-imposed exile, turns himself into a hunter, hunting the Vampires. And during one of these journeys he hears music that takes him to Italy and into the abode of Palazzo della Morte - palace of death - and into the heart of Antonietta "Toni" Scarletti - the heiress to Scarletti fortune and a renowned concert pianist. But Antonietta comes with her share of enemies who want her and her grandfather - Don Giovanni - dead. Now Byron teams up with her in hunting down her enemies, eliminating the threats and keeping her safe, as she is his lifemate. However, will the biggest threat to her - himself - be resolved so they can be together forever? Christine had written The Scarletti Curse two years prior to this book was published, and she continued some of the elements from that book. However, she shows the readers that the Scarletti people come with much more than their healing and psychic powers. I am glad she melded one of her stand-alone novels into this series. I do wonder if she would do the same with the other stand-alone book, The Lair of the Lion. Byron had been in my mind as I was reading the other books and was wondering why he was hiding or when he would resurface. Finally when he had indeed made his appearance, I was humbled at his nature. For someone who wasn’t a born hunter, he molds himself into one and takes upon himself to hunt the vampires, as a penance for a mistake he had done foolishly when he was young that almost cost his friendship with his best friend. His penance, guilt and his sacrifice so much humbled me. Anotnietta is a perfect partner for him, with her share of enemies, troubles and weird family - something that Byron has in common with too. I am pleased that this time around Christine doesn’t have her heroine very very perfect. Anotnietta is blind but a very successful pianist and a shipping magnate. One little flaw that she cannot see doesn’t seem to deter her, and just boosts so much confidence inspiring the readers. For a change Christine does not have her Carpathian male fighting vampires. Instead she has him find his way back to being the best gem-caller and a craftsman, which is what he was before he pursued the path of being a hunter. This shows that Carpathians are not mere hunters but they are tradesmen, artists, healers, musicians and skilled craftsmen. We also see the fun and loving side of Byron - a side that Bryon had enjoyed with his best friend. He gifts his lifemate with a Borzoi dog - Celt - that he considers very friendly and yet very protective. It does indeed show that Christine had done extensive research on this breed of dogs before she introduced them to the plot, per her acknowledgements section. Incidentally her book and the Borsoi dog is mentioned in the National Purebred Dog Day blog here. A few tidbits: Incidentally this book didn’t have the card inserts for free books. However, the immortal rap song by Josef is written for the plot by Christine's daughter Denise per the author's note. Also we see first time the Carpathians chart with different families and their lifemates, siblings and offsprings. Although this chart appears for the first time in a Carpathian book, Christine goes ahead to reveal a few more pairs and possible names for her next three books. The story pace is a bit slower than her earlier books, but I get it why Christine wrote it thus - for Byron who has become extremely cautious in everything he does, and takes his sweet time in courting Antonietta so she doesn’t have to feel rushed into. Also Christine introduces a wealth of story for Byron's sister Eleanor and her kids and husband Vlad. It was nice to see reunion between Byron and Jacques too. Loved the detailed antics of Byron's nephews - Josef in particular. All that made it look like they were just like any other regular family. As always Christine leaves a lot of inconsequential details all through the plot. It will be very interesting to see where and when these all surface again. However at the end of the book, we see an excerpt of the first chapter of her then new series GhostWalkers. However the first book is misprinted in here as Ghostwalker as opposed to Shadow Game. In one of her interviews, Christine had mentioned this error. a. Christine had introduced the Jaguar Species with the plot in the seventh book, Dark Dream, albeit only as a conversation by Vladimir Dubrinsky. However, with this plot Christine fully explores this species, how they have become near-extinct; how the females survived by mating with human males and their perils too. Christine also connects the mystery of how the psychic human women could be converted to the near-extinct Jaguar females with diluted Jaguar blood and powers. b. Christine also introduces the Dragonseeker clan of Carpathians who were tied to the wizards and mages at one point of time, producing powerful mages within their clan. Perhaps we will see more of them as the series proceeds. c. We see mention of Joie Sanders in a conversation. 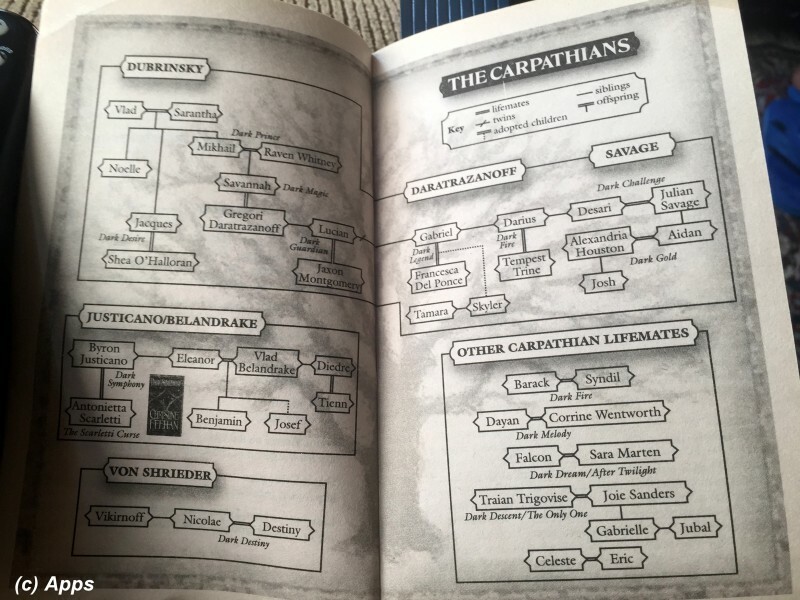 By looking at the Carpathian chart in the beginning of the book, we already know that she would be a lifemate to one of the Carpathians, however how that story unfolds will be interesting to read. e. Christine mentions that a German composer named George Frideric Handel resided in the Scarletti palazzo. I thought she made him up until I read about him on Wiki. Here is more info about him. f. We get to see Byron and Josef turning into dragons while shape-shifting. A segue perhaps to the Dragonseeker clan and their stories. g. Christine introduces a new concept while converting a psychic female with Jaguar blood - the unrepairable eyes of Antonietta after the conversion starts showing images though her eyes. Also Shea talks about her research on why Carpathians cannot make more babies extensively and wants to study Antonietta and her family. She also wants to study Darius further. Perhaps Christine will find a cure for the species soon and bring Darius back in next book or so. a. Gary Jansen is for the first time introduced in the fourth book, Dark Magic. Having already read the remaining books I totally forgot when Gary's character was introduced. It has been 18 years that his character has surfaced and I still didn’t see a story for him. Not sure what is Christine waiting for but would love to see his story soon. b. Christine reveals the possibility of more Carpathians being settled in South America as part of a discussion between Julian and Darius in the fifth book Dark Challenge. Another segue into future plots that could be set in South America. c. Cullen Tucker, a human, joins the singing troupe Dark Troubadours, in the sixth book Dark Fire, when he braves the Society, goes against them and comes to the troupe to warn them of the evil plans. I don’t remember him much in the first time I read these books, only that Gary Jansen had been a constant through the series. May be this time around I will find more about him. d. In Dark Dream, Sara Marten adopts seven sewer children - three girls and four boys - all with psychic abilities. Will Christine bring these seven back as adults and have plots for them too? e. Skyler Rose Thompson is first introduced in this eighth book, Dark Legend, as a 14 year old girl who is battered and injured in every way. Above all she is a psychic. I am sure we will see more of her as the series proceeds. She is shown to be in contact with someone from distant, and Gabriel thinks it’s Lucian who was, but it wasn’t in the end. We will have to wait and see who that would be, although I know it since I am re-reading all the books again. She also has a huge affinity towards wolves, that is a clear segue into who that hidden person in her mind would be. She can also talk to animals. f. In Dark Legend, Francesca muses if her child would be one of those rare females since she had perfected the art of living like a human and walking in the sun. I don’t remember Christine elaborating on Francesca's child further beyond this book, but since I am re-reading them I might find that connection again. g. Barry Woods, a reporter in the Dark Legend plot is not meted with justice or purged of the vampire's influence or any more exploration of his mind to understand about the Society of Vampire Hunters by Christine. Will he be a returning character in future plots is something we have to wait and see. h. In Dark Guardian, Lucian has a chauffeur, Antonio, who is son of Stefan and Marie - human family who lived with Aidan Savage and his lifemate Alexandria Houton and her brother, Joshua. Lucian gets Antonio on loan for a while to protect his during the day. In Dark Legend we saw that Santino and his wife Drusilla come to live with Gabriel and Francesca to protect Skyler and keep their home safe. Santino is also mentioned as son of Stefan and Marie. Either Stefan has two boys and one each serving each of the Dark Twins. Or Christine mis-represented Santino as Antonio. Either way I wonder if these characters come back again. a. In the second book, Dark Desire, Rand mixes some kind of poison in his blood and infects Jacques and Byron which causes them to severe the mental path the Carpathians share. So far Christine has not elaborated on this further beyond that book. b. Few children who have born are Males, most not surviving the first year of their life. No one knows why females are rarely born, although now they discover that paring a Carpathian male to a Human psychic female will give them female kids. However, no one knows why most kids don’t survive the first year. Shea O'Halloran (aka Dubrinsky) is still performing research on how to better the food for their children so they survive. c. Vampires are congregating; attacking in coordinated methods as opposed to their solitary existence; doing a hypnotic dance that they try in hoping to transfix the Carpathian hunters during the battle; ability to create a holding spell; able to inject a fast acting poison into the Carpathians and Humans that is complex and would impact the nervous system immediately. d. Society of Human Vampire Hunters who constantly hunt the Carpathians mistaking them to be Vampires. Most are used as minions by the vampires to wreak havoc on both Carpathians and humans alike. e. The undead's minion - human converted to ghouls by the Vampire - have learned the ability to attach themselves to a hunter like a shadow using a difficult spell obviously imprinted by the Vampire on to the hunter. They could also use animals such as rats, birds and insects to pry into other's lives through their eyes. f. The antagonist Vampire was after Sara Marten in Dark Dream, as he needed her help to track the tomb of the master wizard and book of knowledge that will give anyone who holds that book untold power. Another insight into what Christine would bring to the reader in her Carpathian books. 5. Lifemate pairs introduced as the series progresses: Will Christine have a plot for these pairs sometime in future? Since I have read all the books already, I know for sure there isn’t one yet. But hoping she will have some kind of plot around them in future. b. Vlad and Eleanor Belandrake - Eleanor is In Dark Prince we saw that Eleanor was pregnant with child. Finally in this book we see what happened to him. That child is named Benjamin "Benj". Eleanor is sister to Byron Justicano. I have to wait and see if Christine will bring back Benj again as a full grown Carpathian male. d. Vladimir Dubrinsky and Sarantha - Mikhail and Jacques Dubrinsky's parents - They are shown as dead in Dark Guardian plot. a. Dimitri Tirunul – another ancient Carpathian mentioned briefly for the first time in a conversation between Jacques and Shea in Dark Desire plot. First introduced almost 15 years ago, we as readers already know that his story would not be fully evolved until the 25th book in the series. In Dark Legend, Francesca alludes to the fact that Dimitri is a renowned scientist; works for preservation of wolves and guards them in the reservations of Russia; and has a wolf foundation. Gabriel remembers Dimtri as being a unique, loner even as a fledgling with a dark core of violence. b. Dayan - part of Darius and Desari's family, also members of the singing troupe Dark Troubadours. Towards the end of Dark Fire, Dayan leaves to Canada with Cullen Tucker to ensure Cullen's safety and also travel a bit to get adjusted with all the males around him who have lifemates. This gives me a pause to think that Dayan's story will be set in Canada. c. Dominic Dragonseeker - First time introduced in this book, with added little details about wizards / mages and a war between them and the Carpathians. We also see that Dominic is looking for his sister - Rhiannon Dragonseeker - a powerful mage although just an apprentice, thought to be lost. d. Josef - We get introduced to Josef first time in this plot. A Carpathian kid who is a totally different from the rest of them, out to prove that he can do everything in this world, trying out everything he can. I am guessing we are going to see more of him in future books. Although adopted by Vlad and Eleanor, his birth parents were Lucia and Rodaniver. Although it seems that they have gone to ground and spending their time eternally there, it doesn’t seem that they are dead (Christine, thoughts??). e. Francesca Del Ponce - lifemate to Gabriel Daratrazanoff. Her story is told in Dark Legend. She is a powerful healer and had perfected the way to live like humans, thinking Gabriel was lost to her forever, although it came at the cost of her limiting her powers as a Carpathian. Has ability to bring peace to anyone who is in her vicinity just by being there or by touch. She can make stained glass patterns that are specific to a patient or person's need and bring healing to them. She has a female child with Gabriel and as of Dark Guardian plot the child, Tamara, is not yet a year old. a. On Pg. 145, Christine mentions though Byron's musings, that they had only one blood exchange. But I see that by then there were two blood exchanges between Byron and Antoniette - First exchange happens on Pg. 48-49; Second exchange happens on Pg. 128. A clear miss in Christine's part. Again on Pg. 189 Christine confirms that there had been two blood exchanges. b. On Pg. 261, line 13, it should be "front of Paul and Tasha…"